Every year, the Classic Plastic Model Club holds a Club Challenge for our annual Club Exhibition in October. This year it is box stock with any finish you want. 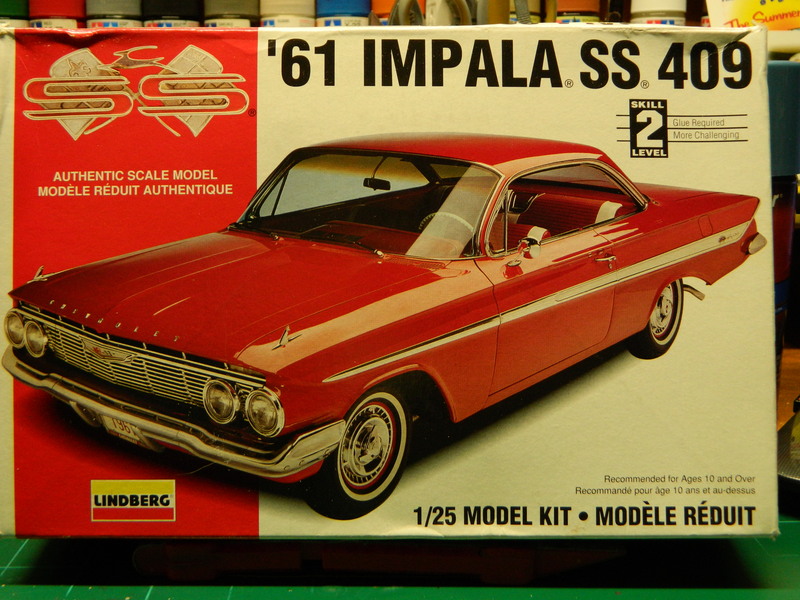 My project for the Club Challenge will be the Lindberg 1961 Chevrolet Impala SS 409. 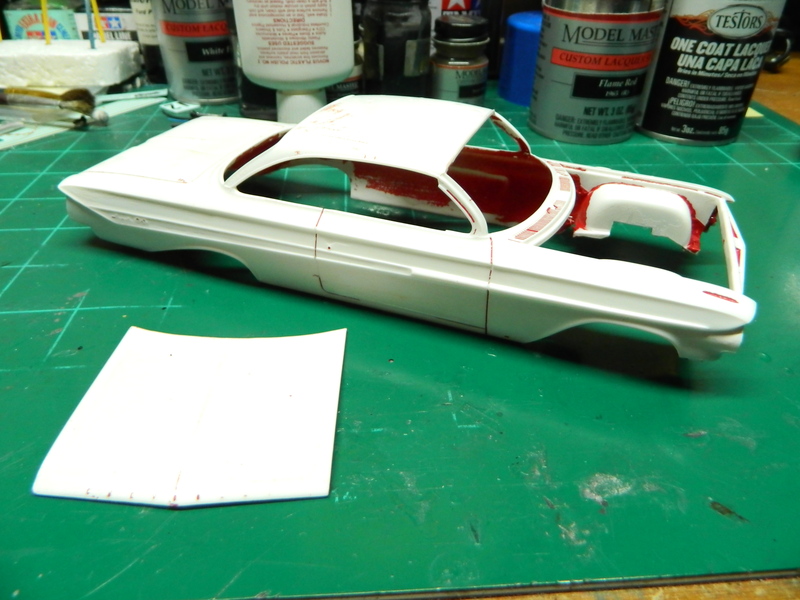 My paint will be Model Master Flame Red with a matching red and white interior. 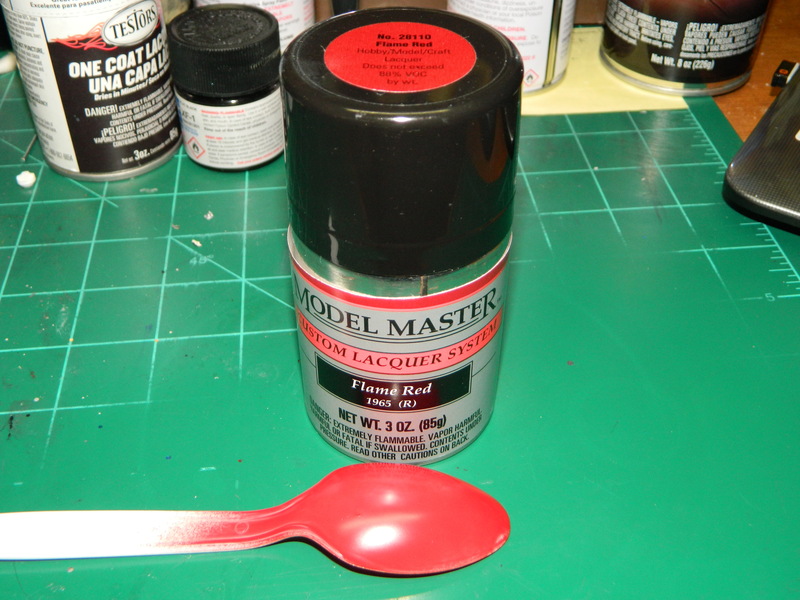 I did a sprayout on a plastic spoon to get a sense of what the color actually was, since I have seen several shades that range from bright red to almost a maroon and they are referred to as Flame Red. The color is a little dark, but I like it. Time to start is now. If I wait until the last minute, it'll never get done. Yes, a classic for sure! I can place this next to the '62 that I have on the shelf with room on the other side of the '62 for a '63 Impala that I have in the stash. I built one of these in the same color combo many years ago. I would really like to go back and build another. 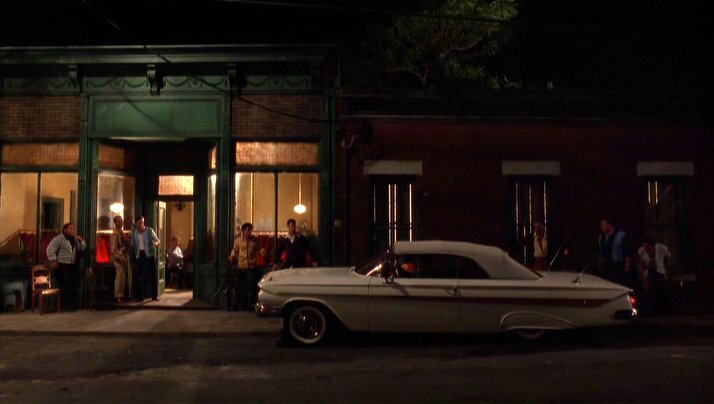 The convertible from the movie "Goodfellas". There is a convertible version with black box art on it. It has lowrider wheels so I don't know if the kit has the stock wheels, too. 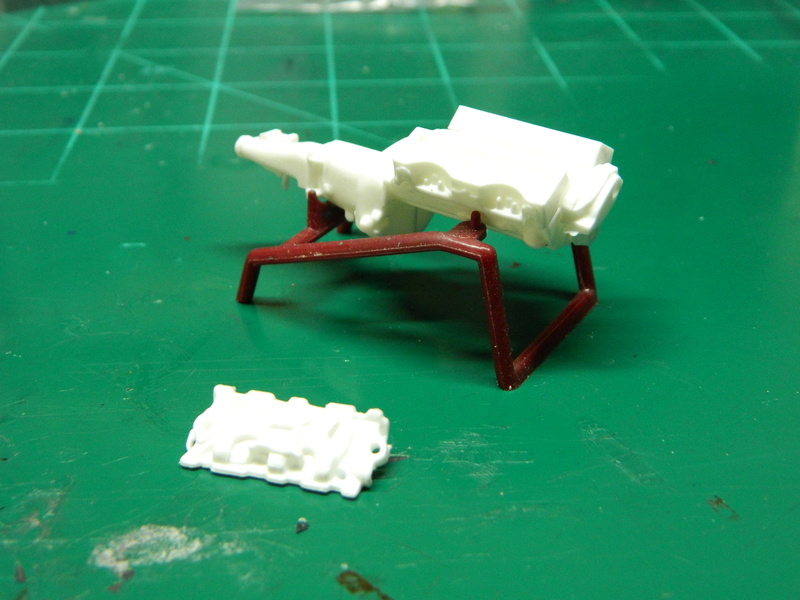 I have one of the original Lindberg convertible kits. 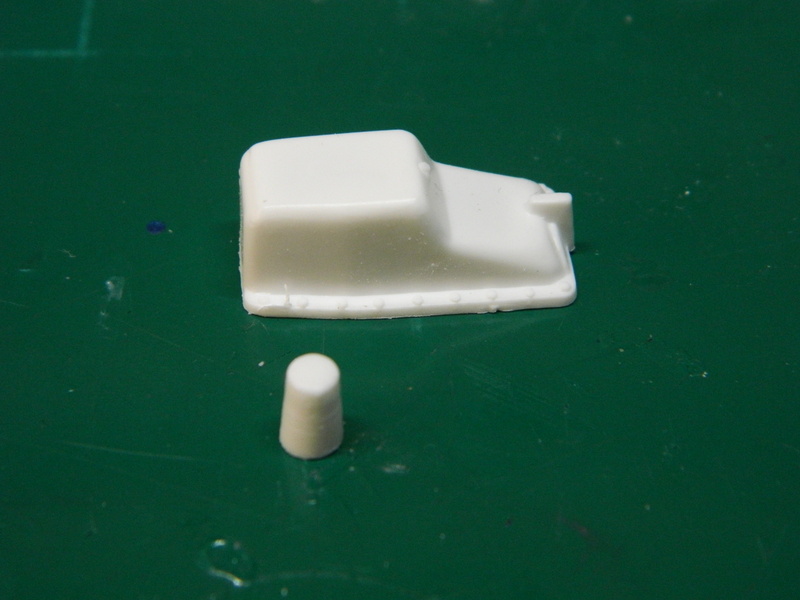 It does not have the stock wheels or an up top, both of which I would require if I were to build it. I'm not sure were you can find the up-top or the stock wheels and tires. Maybe someone has the stock wheels and tires from a build where thay had changed them for a set of mags and wide tires. 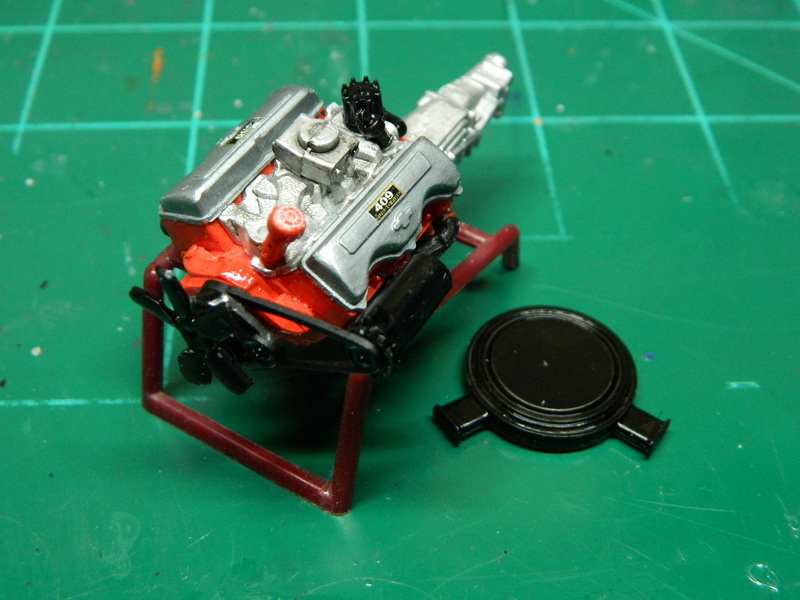 I got tired of polishing my Bullitt Mustang and the '70 Charger R/T, so I decided to start a little assembly of the 409 CID engine. 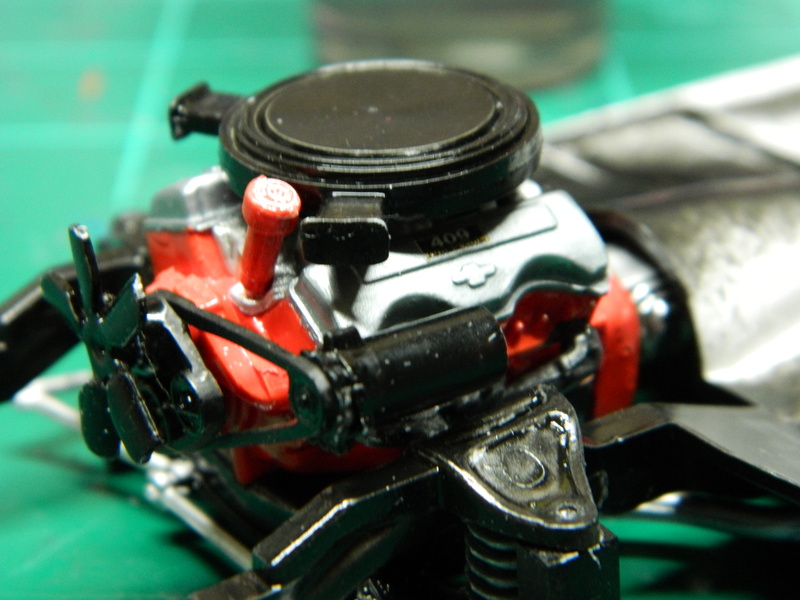 One thing I didn't like about this engine was that the oil filter was moulded with the oil pan. I used a P/E saw and removed the oil filter. I always liked the engine stand that AMT etc supplied back in the day.Your 409 block looks great sitting in it. Wish I could find a few today! 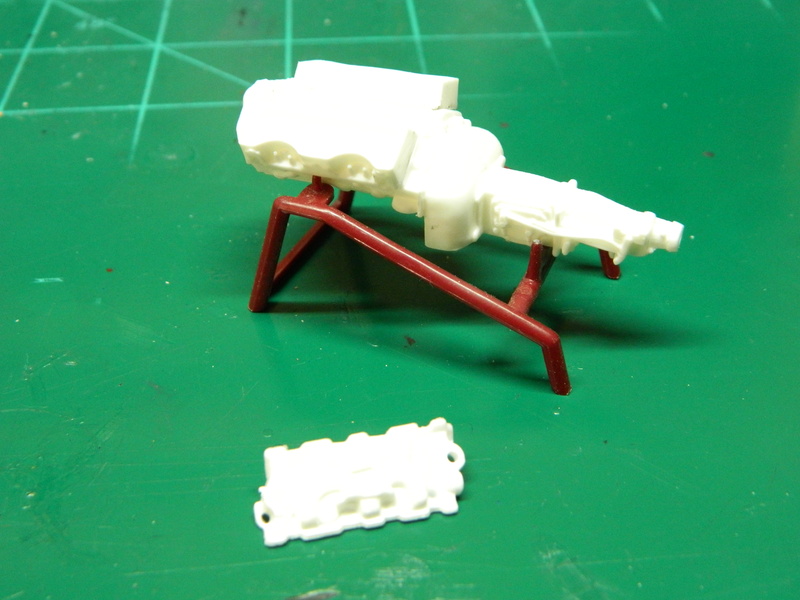 This engine stand came out of the AMT '39/'40 Ford Tudor Sedan. 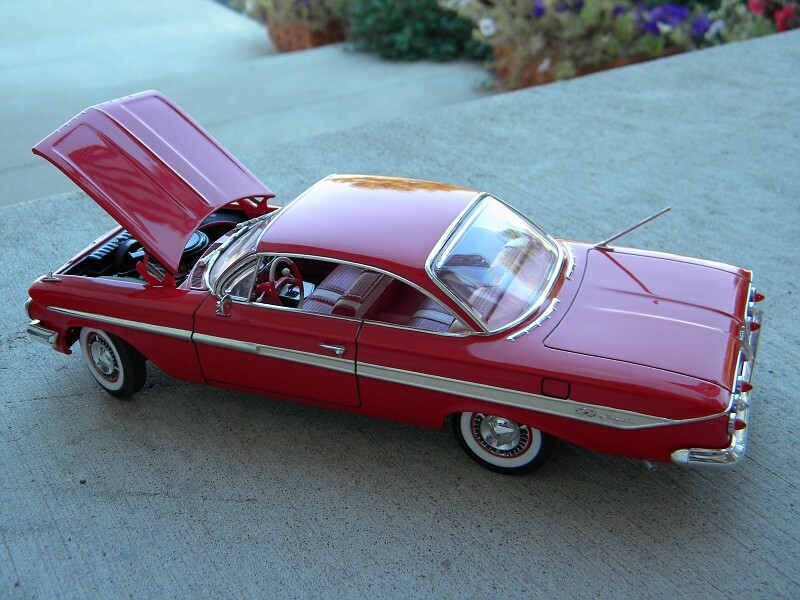 Did you do the diorama behind the white convertible.? All the work is great. That is not a diorama. That is an actual scene from the movie. 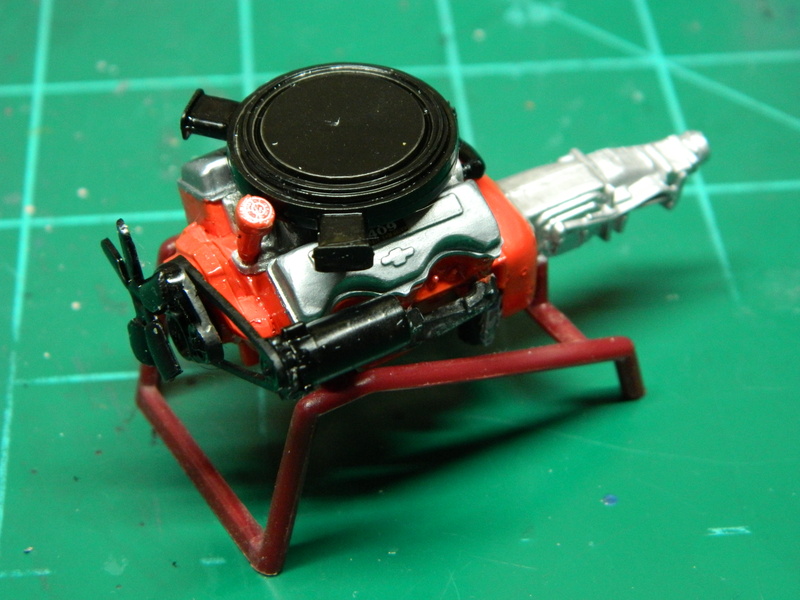 I got the 409 CID assembled and decaled. 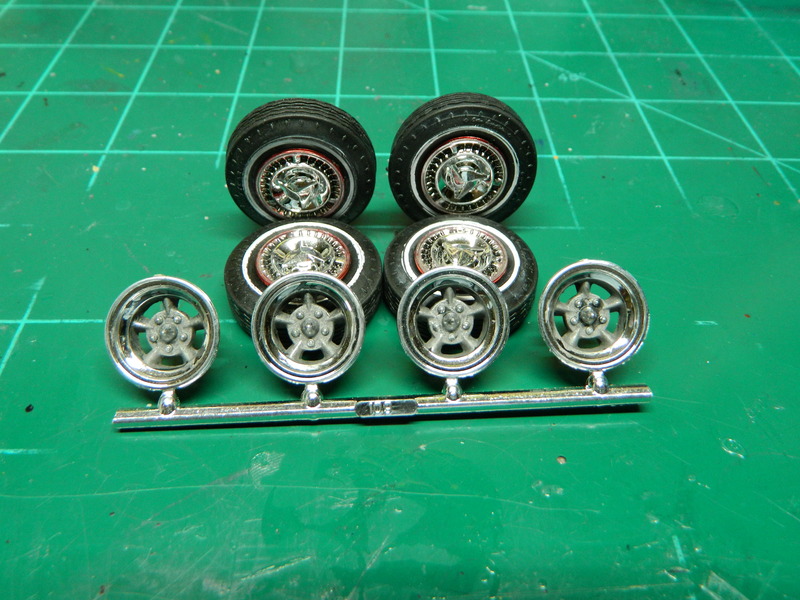 I assembled the stock wheels and tires. The American Racing mags are for after the Club Challenge and will replace the stock wheels and tires. I just need to find a set of tires in the parts box for the mags. 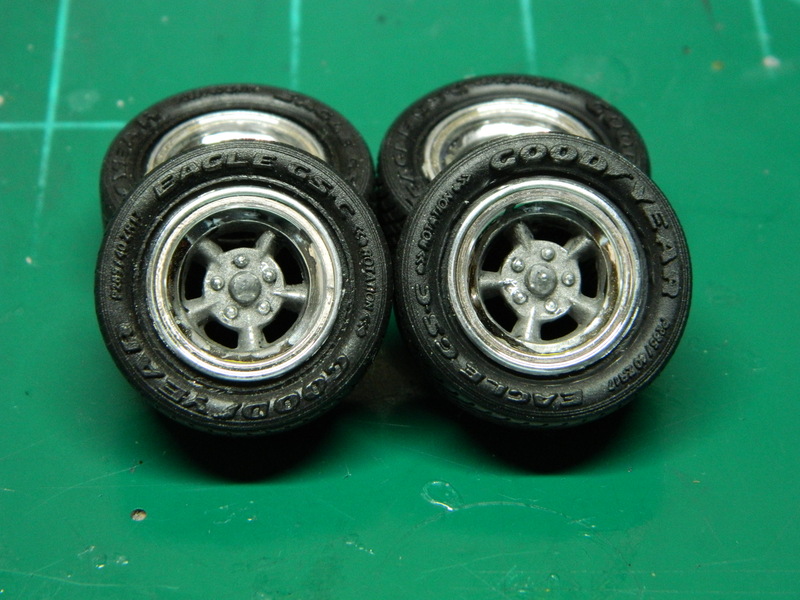 I rummaged through my parts box and found a set of Goodyear GS-Cs for the American Racing mags. 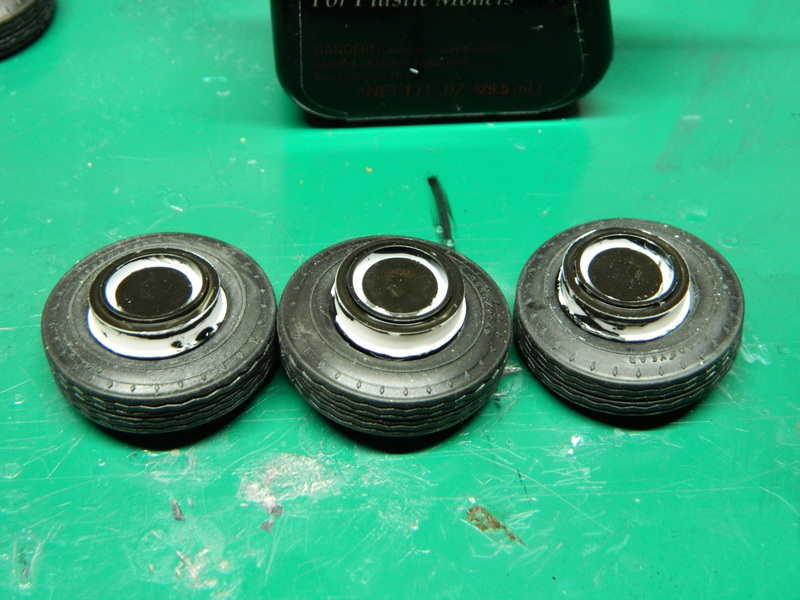 But, after looking at the mags, I need to clean them up some as I was a bit sloppy painting the spokes. 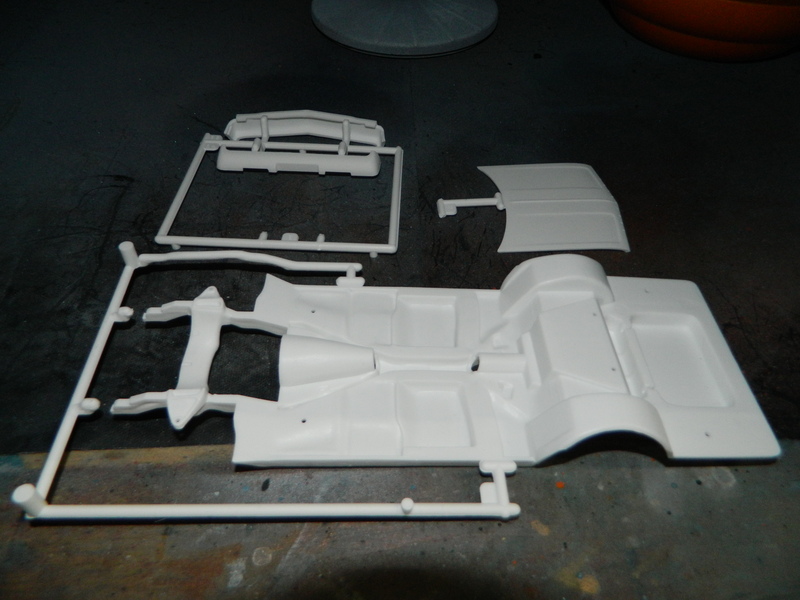 The body and associated parts are now in a coat of Dupli-Color White Primer. Now for a some light sanding. I hope so, Kevin! While I am primarily a Mopar and Ford builder, I like to branch out a bit and this build for the Club Challenge is certainly different! 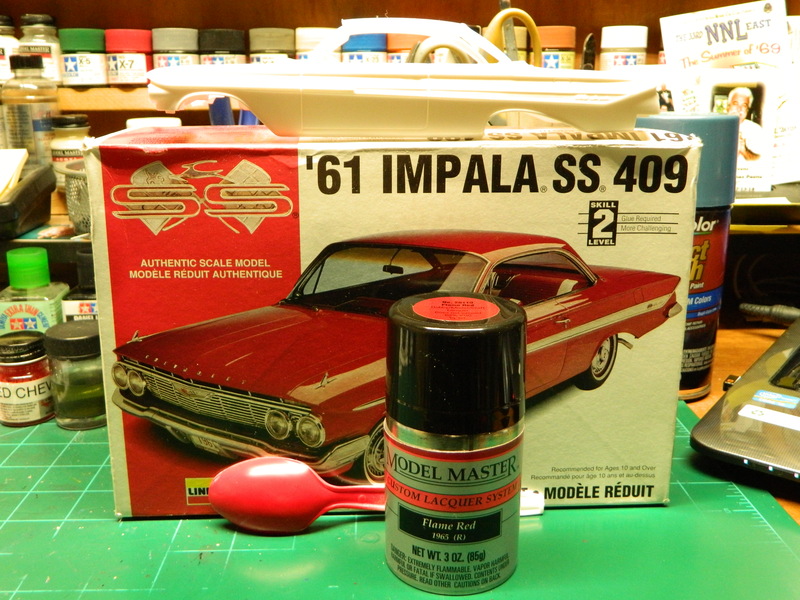 While I had the paintbooth up and running, I painted the Impala with Model Master Flame Red Lacquer. 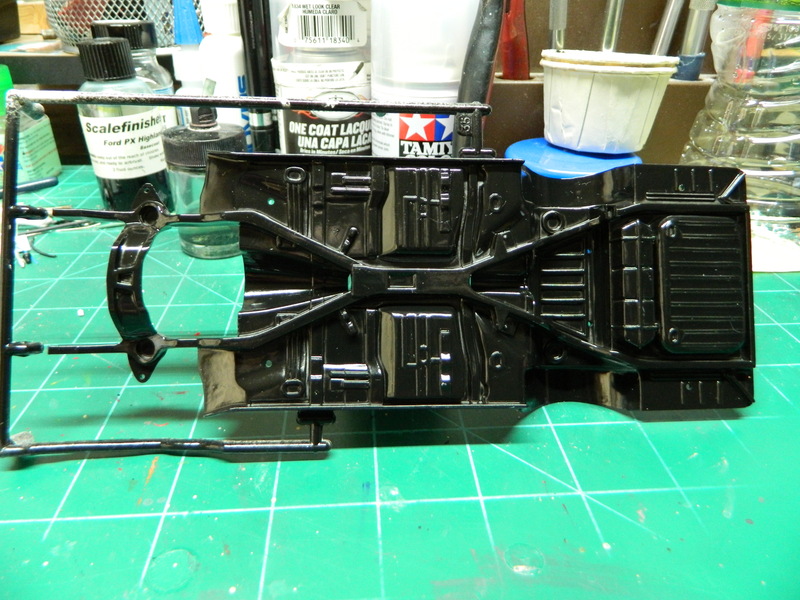 I painted the chassis with Rustoleum Painters Touch Semi-Gloss Black. It's a touch glossy and tacky, so some time in the dehydrator is in order. Well, my bad painting luck has returned! The paint cracked on top of the primer. 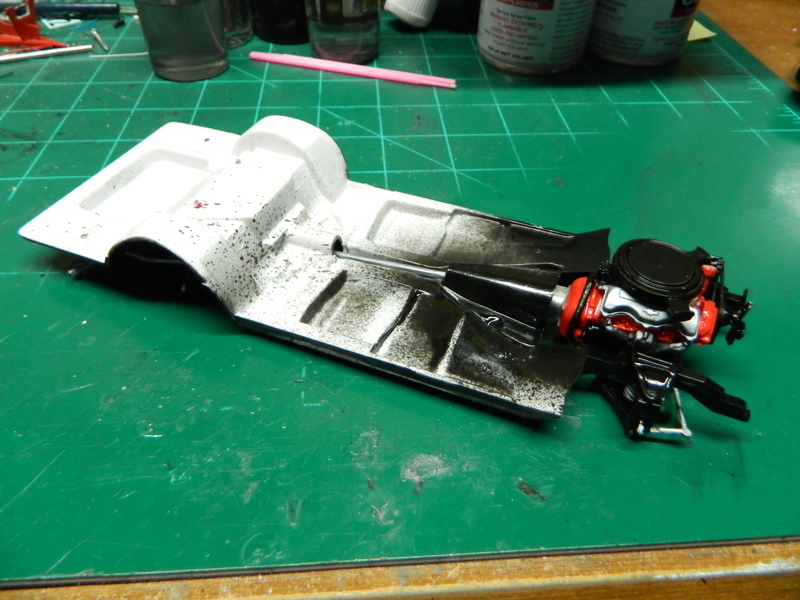 I think I'll strip the paint and start all over again with the same brand primer and paint. 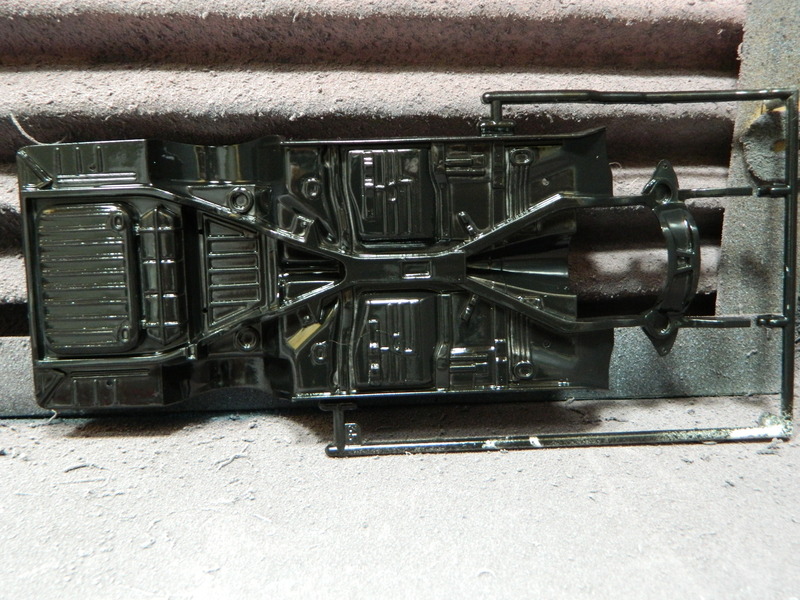 This is supposed to be semi-gloss black and it looks like gloss black. 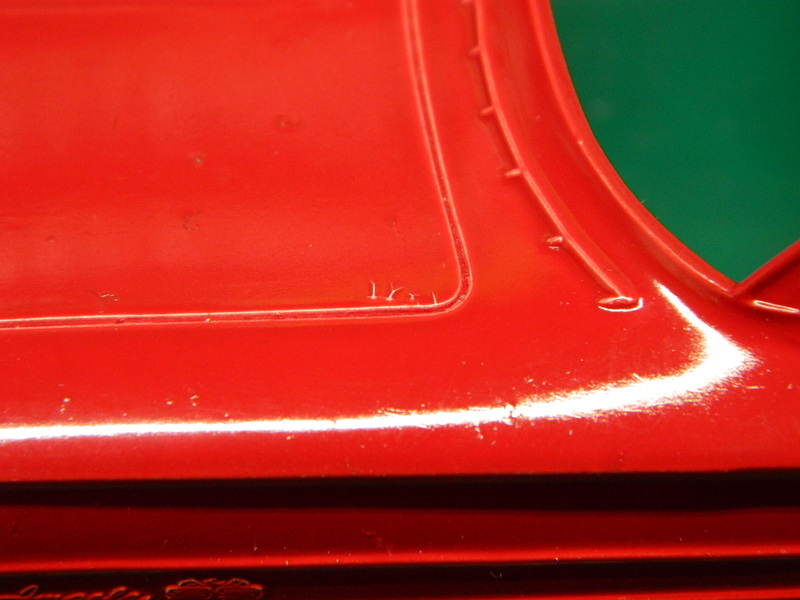 This is enamel paint, so I'll have to clear coat it with Acryl Semi-Gloss Clear. 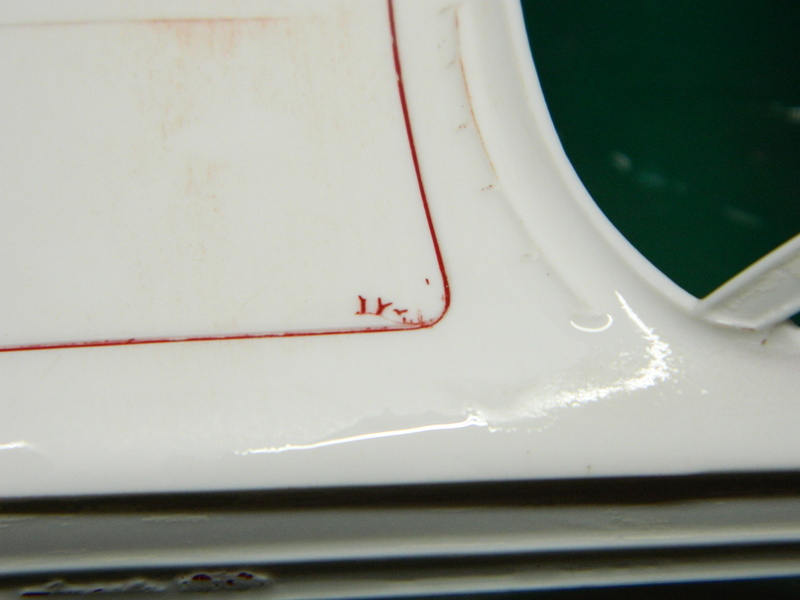 I notice too the paint has pulled away from panel lines and engraved detail. Might I suggest lighter coats to build color before a wet one. I'm not 100% sure as to what caused the cracking, but the body is in the stripper and I'll start over with the same paint and matching the same brand primer. Fresh out of the Easy-Off bath. 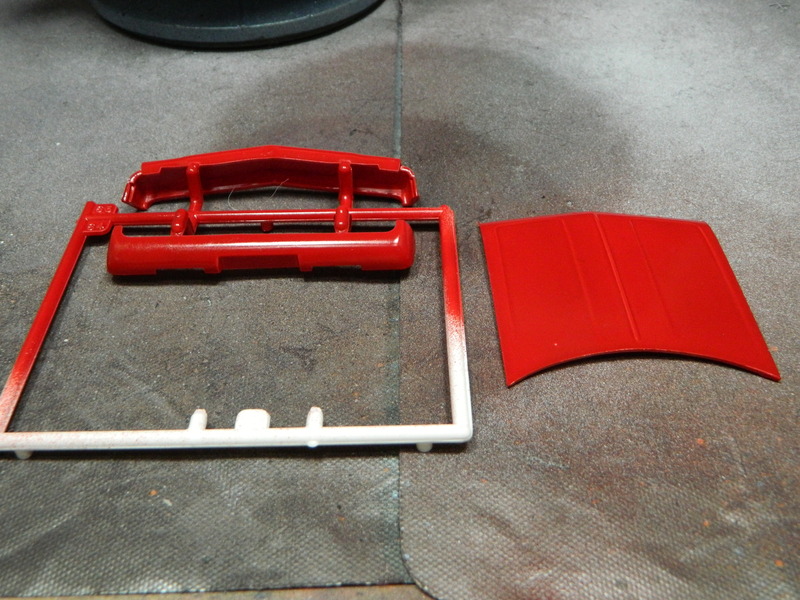 I got most of the Model Master Flame Red paint off the body. 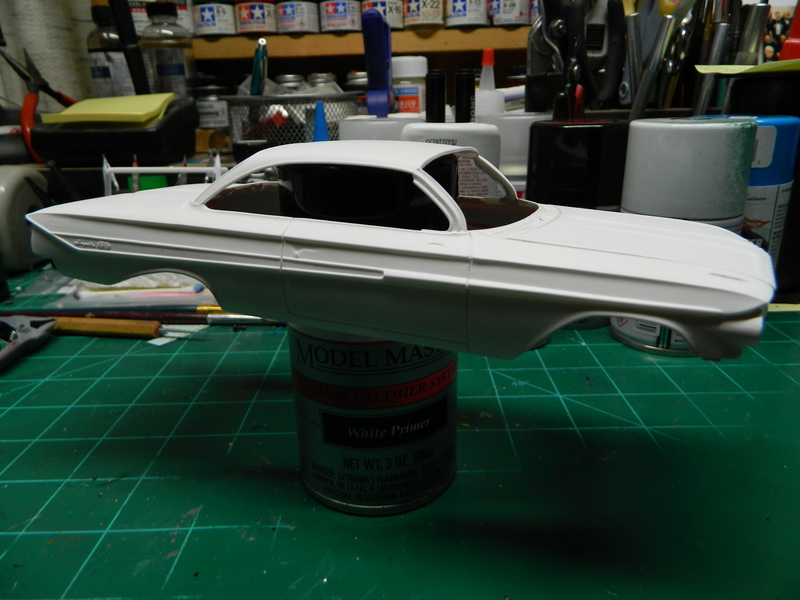 Some sanding and a good coat of Model Master Lacquer White Primer to restart the painting process. 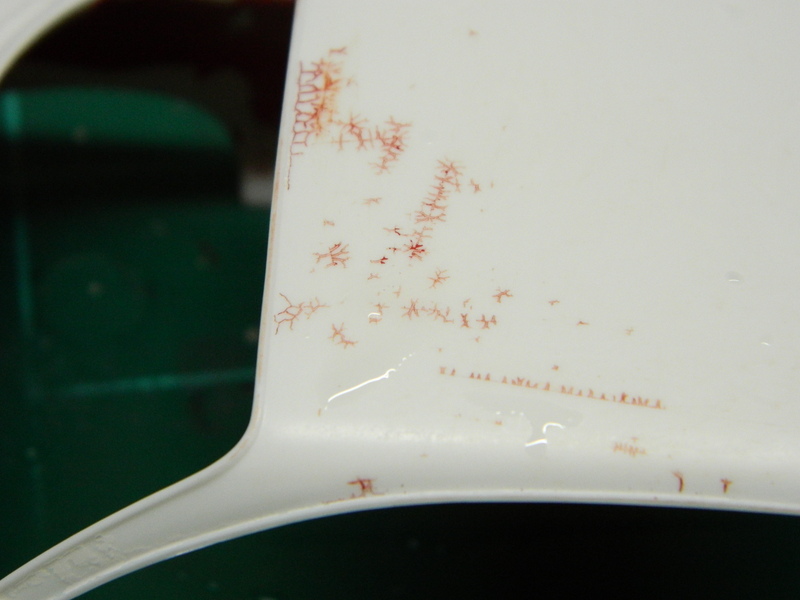 Other than what has been explained to me by others in my Club that had issues with older Lindberg plastic and new paint, I am clueless as to why this plastic has cracked. 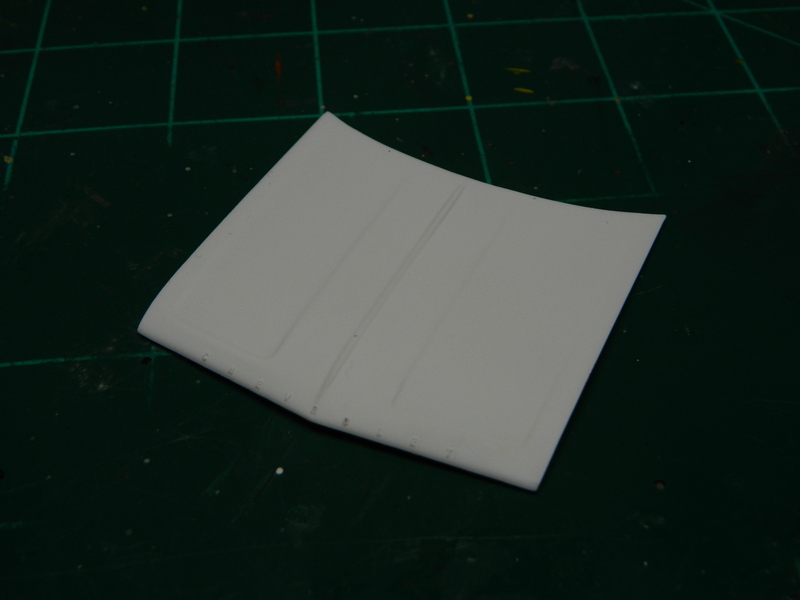 I'll sand all this down and then reprime the surface. 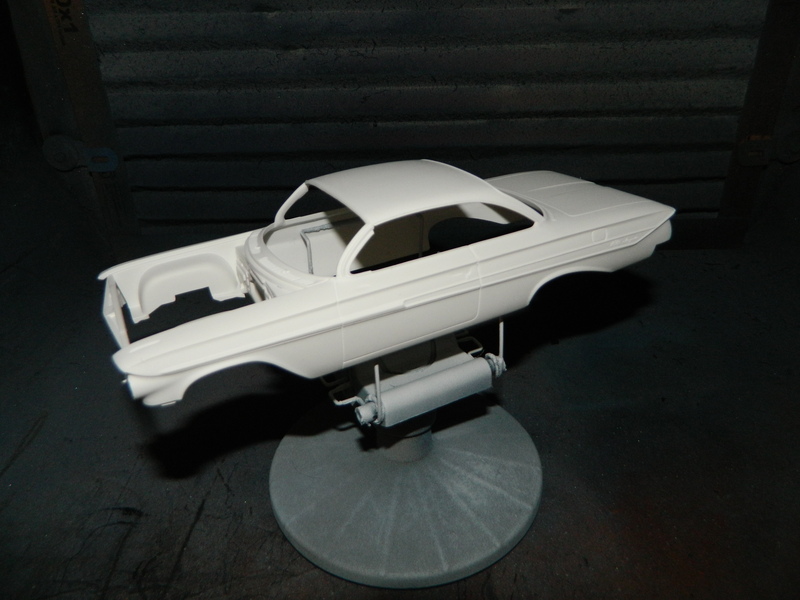 I fired up the paint booth this afternoon and shot the Impala with a good coat of Model Master White Lacquer primer. Now for some sanding and then back to the paint booth for some Model Master Flame Red Lacquer. 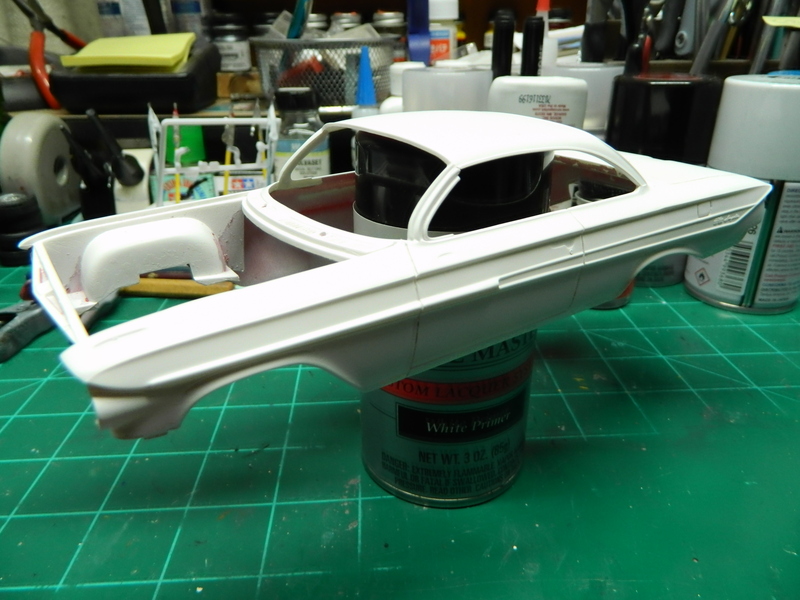 I decided to work on the Impala yesterday. 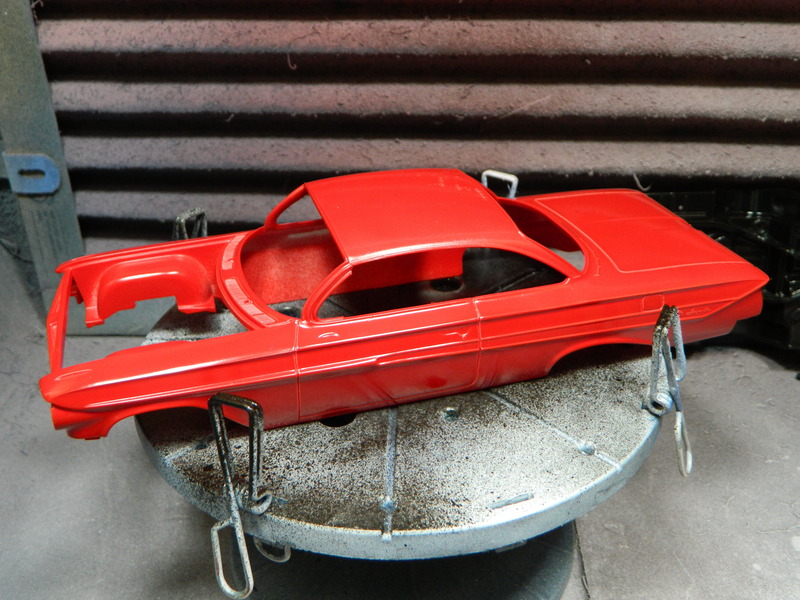 I painted the seats of the Impala with Tamiya X-7 Red which a very close match to the Model Master Flame Red that I'll be using for the body and hood. 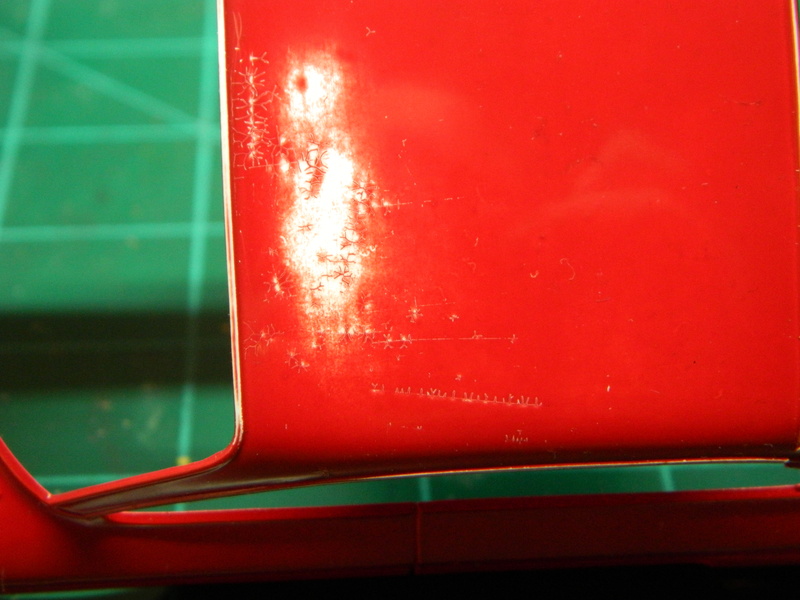 But, the paint seeped under the tape I had used so those will need some cleanup. 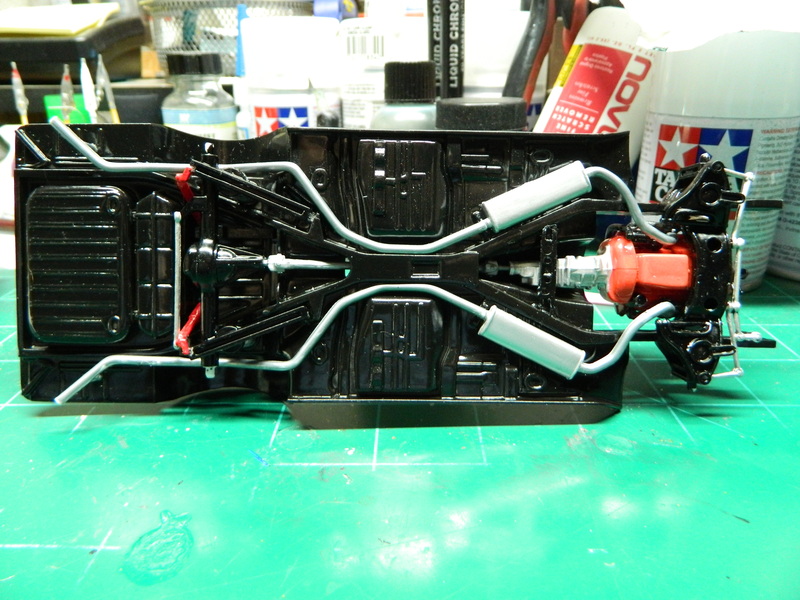 This afternoon was spent assembliing the chassis which is almost complete. 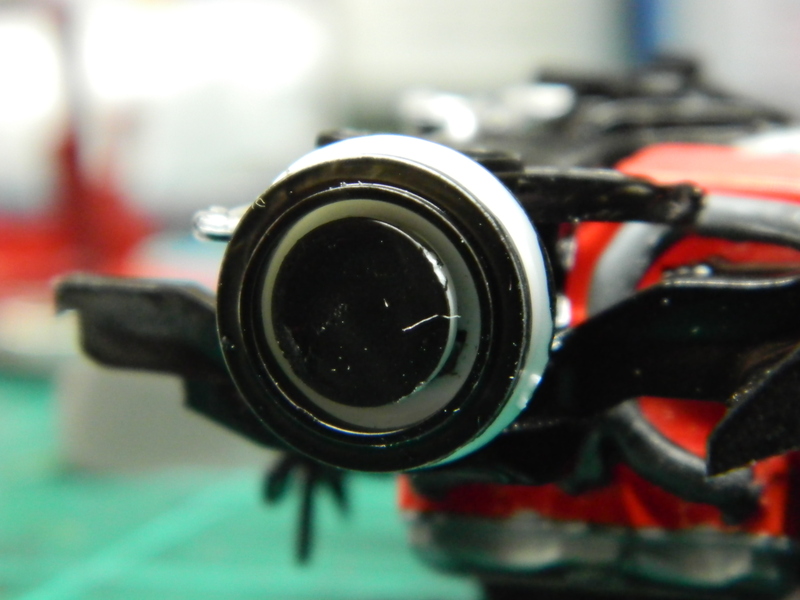 I assembled the wheels yesterday and glued the front wheels to the chassis, then i found out that the wheels wobbled! Not sure why I continue to make these wheels want to roll since they should glued solid to prevent the model from rolling. 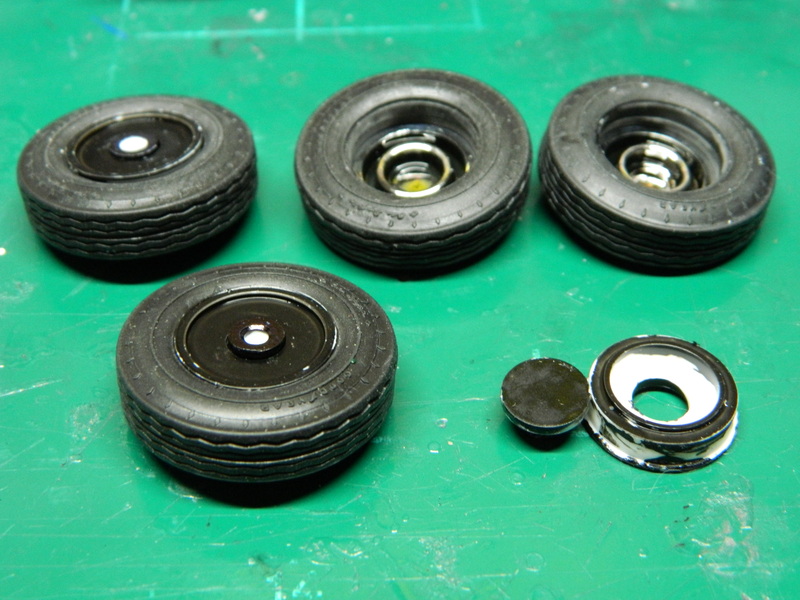 I took the wheels apart and glued the wheel backs and the wheel retainers together. No more wobble!